KATHMANDU, March 24: Kota Dhuku Petrol Pump is just a few meters from Balaju Chowk while coming from Sorhakhutte. Two fuel dispensers, for petrol and diesel, adjoin the footpath. There is no compound wall. The fuel pump’s containers are on the ground floor of a four-storey house. The pump operator is an authorized dealer of Nepal Oil Corporation. Motorists stop on the busy road to refill their tanks. During office hours, the long queue of customers disrupts traffic along the Balaju-Sorhakhutte road. The road itself is always wet with some fuel spill. In lack of compound space, there is no place for a fire control system in case of disaster. No preventive mechanism is in place. The fuel station has become a nuisance for local residents and pedestrians. NOC had instructed it on multiple occasions to close down, saying it was ‘operating in a risky manner without proper infrastructure’. The instructions were never heeded. Uttam Das Manandhar, the pump owner, instead went to the Supreme Court claiming justice for the encroachment of his land during road expansion. The court instructed the authorities ‘not to remove the petrol station for now’. And NOC quietly backed off. On the opposite side of the road lies Chakrapath Fuel Center. According to NOC, it was opened by Ramnath Dangol in 1990, installing the fuel dispensers just a few feet from the road. Also a victim of the road expansion drive, the fuel station’s compound wall was bulldozed for road expansion. There is a shop and a motorcycle workshop on the premises. Many other petrol pumps in the valley find themselves in a similar situation. Kanak Trade Concern along the busy Teku-Kalimati road section, Shyama Oil at Kalanki Chowk and Gayatridevi Oil Stores at Ekantakuna all operate on the roadside. Adjoining Gayatridevi Oil Stores is an auto repair establishment, GS Workshop and Auto Parts. They use welding gear and the sparks emitted pose a huge risk of fire hazard, given the proximity of the flammable materials at the filling station. Commuters waiting around the premises for their bus can be seen with cigarette in hand. Overhead electric wires pose the risk of short circuiting. Yet, there is no water tank or other necessary infrastructure to cope with potential hazards. Fire fighters say the arrangements “are not sufficient to prevent damage in case of mishaps”. SP International Inc Petrol Pump along Jawalakhel-Pulchowk road is also right on the roadside and cheek by jowl with a motorcycle workshop, UD Modern Design. Overhead electric wires are present also. Sajha Petro Pump, Pulchowk has a fence to keep out unauthorized people and it has tried to do something about the electric wires. There is also a power transformer nearby to worry about. There is a petrol station at each kilometer interval along the busy Balaju-Chakrapath road. Locals said this is a densely populated area and there are big party palaces nearby where hundreds gather regularly. Manjushree Petrol Pump at Lagankhel, Lalitpur is another example of unsafe location. The pump is right in the middle of the road and vehicles refill from both sides of the road. One can sense similar risk on the Satdobato-Jawalakhel road section. Shanti Devi Petrol Pump, operated by the Nepal Army, looks relatively safe. But it is also in a congested area on the roadside and without adequate safety measures. Mahayan Petrol Pump and Machchhindra Pump at Kumaripati are also in crowded locations and without any compound walls. Officials at the Metropolitan Emergency Operations Center (MEOC) said if the refilling stations are not better regulated, Valley residents could face a major disaster any time. “An area around a petrol pump is a risk zone in itself. But location in densely populated areas and lack of ability to minimize the risk make these like landmines,” said MEOC chief Kishor Kumar Bhattarai. 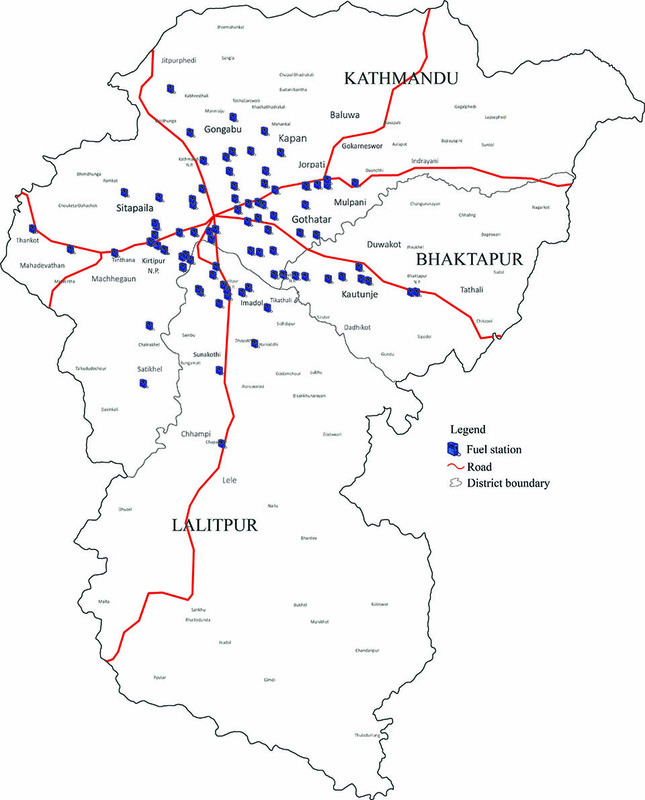 According to NOC, there are 123 petrol stations in Kathmandu, 29 in Lalitpur and 20 in Bhaktapur. NOC officials say pumps operators do not bother about possible disasters. “Some pumps were established even before the government introduced the criteria for operating them. 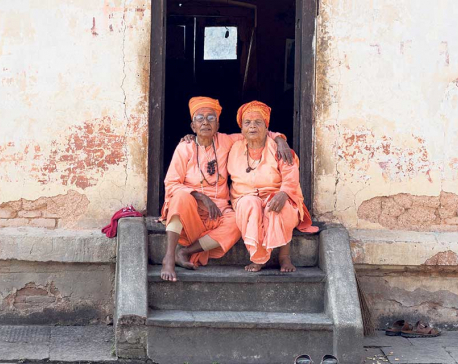 So, we are unable to make them relocate,” said NOC Managing Director Surendra Paudel. One refill station normally stores at least 20 kiloliters (20,000 liters) of diesel and 12 kiloliter (12,000 liters) of petrol. This is as per NOC criteria and it means 3,440 kiloliters (3.4 million liters) of diesel and 2,064 kiloliters (2 million liters) of petrol are in underground storage in the Valley at any given time. Besides this, NOC’s depot at Thankot that supplies the petrol pumps stores 5310 kiloliters petrol, 8400 kiloliters diesel and 710 kiloliters kerosene. The fuel depot at Sinamangal near Tribhuwan International Airport stores 7,000 kiloliters of aviation fuel, according to NOC. Officials say NOC always stores 90 percent of total capacity. Given these huge quantities of fuel in storage, the surrounding areas could face massive causalities in case of fire. It is high time one reviewed the safety measures and NOC has vowed to do just that for its Sinamangal and Thankot depots. “It is not immediately possible to relocate our depots. But we have published tender notices for new refilling equipment for the depots to enhance safety,” said Paudel. When the depots were set up those areas weren’t densely populated. But due to increased urbanization, the depots are now surrounded by heavy settlements. And while the authorities claim to have adopted safety measures, Thankot locals said they are worried about their safety. NOC has formulated safety directives for operating fuel stations. However, station operators in the Valley do not follow them. The resources mentioned in the directives are also not sufficient, according to firefighters. As per the directives, each petrol pump must compulsorily have four fire extinguishers weighing 10 kg each and four buckets of water, sand and pebbles. But these are not sufficient in case of a fire. MEOC also does not have a sufficient number of fire trucks to contain a big fire. “We cannot even imagine the scale of loss from a fire outbreak,” said MEOC chief Bhattarai. As per the directives, which were prepared in 2016, a petrol station in the terai and inner terai should have at least one bigha (13 ropani) of land (except in Udayapur, Chitwan, Makwanpur, Dang and the hill areas of Surkhet). The hill and mountain areas should have five ropani. Likewise, there should be a concrete compound wall of three to five feet or cemented pillars with barbed wire on three sides. The directives also mention the requirement of a canopy of around 18 meters and up to 30 meters of roof to cover the refilling area, five toilets including a disabled-friendly one, a fire retardant system inside the compound, underground containers, mapping of its capacity and quantity, and the capacity to serve eight vehicles at a time. But NOC has not been able to enforce the criteria. NOC officials admit that none of the petrol stations inside the ring road would be in operation if they enforced the safety criteria. Most petrol pumps in the Valley were already in existence before it became densely populated. NOC has revised its criteria over time, but it became increasingly ‘impractical’ for the petrol stations to implement them. The road expansion drive initiated in 2011 further complicated matters. As per NOC criteria, there must be a distance of at least 10 km between two petrol pumps so as to prevent fire spreading between them. But many Valley pumps are only one kilometer apart. Likewise, the underground containers for petroleum products should be well away from human settlements and there should also be a three to five feet wall around the petrol station. Although many stations don’t meet these standards, NOC officials shrugged this off, saying the stations were already in existence before the criteria was set. 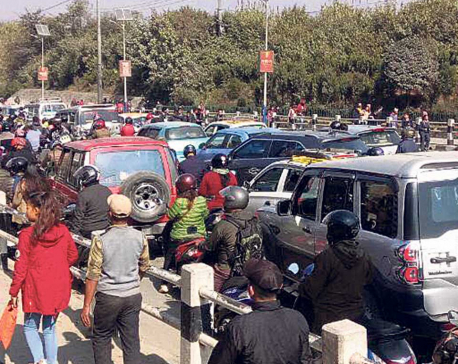 Deputy Managing Director Sushil Bhattarai says the road expansion drive wrecked havoc at most petrol pumps. NOC cannot remove unsafe petrol pumps on its own, NOC’s Executive Director Paudel said and called for a separate law. “We are just a company, not a regulatory body,” he added. Many incidents point to the risk of operating pumps alongside the road. In November 2017, Alam Mechanical Workshop inside the premises of Tripureshwar-based Jayanti Oil Store caught fire, killing an employee. Pump owner Binod Jajuriya had rented out the space to the workshop. When the fire started, it was brought under control immediately and it didn’t spread. However, besides the one death two others were injured and property worth millions destroyed. According to Bhattarai, there were fire incidents at half a dozen petrol pumps before that one. During the Indian blockade in 2015, an office nearby the Nepal Army petrol pump at Bhadrakali caught fire, putting the pump itself at risk. Only timely intervention by the fire brigade stopped it from spreading to the pump. However, this wasn’t made public at the time.